Rainbow trout, 18 cm (7”) long. Location: Deer Creek, California (Yuba River basin). Date: 6/21/2007. Steelhead. Caught and released in the South Fork Mokelumne River, San Joaquin County, CA, 18 Oct 2013. Photo by Gary Riddle. Steelhead in a Santa Monica Bay coastal stream, southern California, in February 2009. Photo by Steve Williams, The Resource Conservation District of the Santa Monica Mountains. California Department of Fish and Game provided funding for the study. Steelhead. Location: A river in Alaska. Photo courtesy of Steve Tjosvold, UC Cooperative Extension. Rainbow trout (McCloud River redband), photographed at Trout Creek, California in October 2006. Photo by Michael Carl. Rainbow trout (Warner Lakes redband), photographed at Mud Creek, Oregon in July 2009. Photo by Michael Carl. Rainbow trout fry, redband sub-species. Date: 7/10/2007. Rainbow trout, frontal view. Location: Deer Creek, California (Yuba River basin). Date: 6/22/2007. Rainbow trout, head. Date: 7/10/2007. Rainbow trout, tail. Date: 7/10/2007. PLEASE NOTE: The photos and information shown here are for Rainbow Trout / Steelhead, of which Klamath Mountains Province Winter Steelhead is a Distinct Population Segment. Rainbow Trout are by definition a cold water fish. Optimal growth occurs at 15-18ºC and mortality typically results at 24-27ºC. New research is revealing populations of trout that are sustaining life in conditions previously considered lethal. Trout or Steelhead require near saturation levels of dissolved oxygen to grow, though these fish can live at levels as low as 1.5-2.0 mg/L. 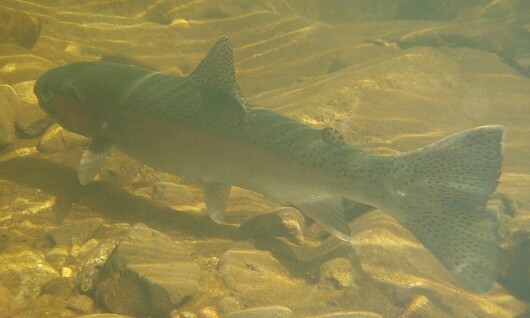 Oncorhynchus mykiss generally have one of two distinct life patterns: resident inland trout and sea-run or anadromous Steelhead. 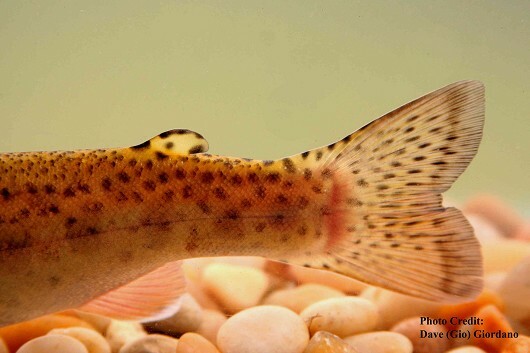 Some inland trout do migrate for the purpose of spawning or food foraging. Resident forms of O. mykiss often spend their entire lives within a few hundred meters of stream or within the same lake. Steelhead or sea-run trout hatch in freshwater and then migrate to the ocean, finally returning home to spawn. Times spent in freshwater and in the ocean vary according to geography, life history patterns, and effects of natural phenomena. Spawning occurs in places where the streambed is composed of gravelly substrate, usually in riffles or pool tails. The female fish digs a redd (nest) and deposits 200 to 12,000 eggs depending upon her body size. Resident Rainbow Trout usually produce less than 1,000 eggs per year while Steelhead may produce up to 2,000 eggs per kg of body weight. After breeding the resident trout disperse to slower waters and the Steelhead rest before moving back out to sea. 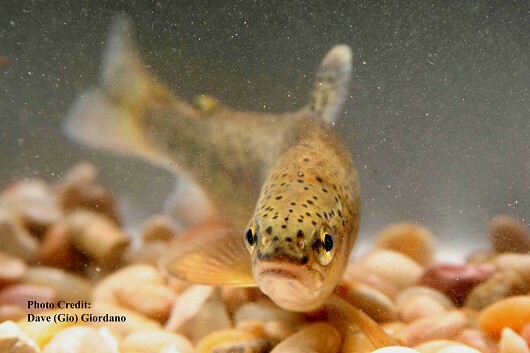 In 3-4 weeks the eggs hatch and the young trout spend another 2-3 weeks under the cover of the gravel before emerging as fry. In some instances the fry of anadromous Steelhead will emerge soon after hatching and swim straight to the ocean to avoid dry summer periods. 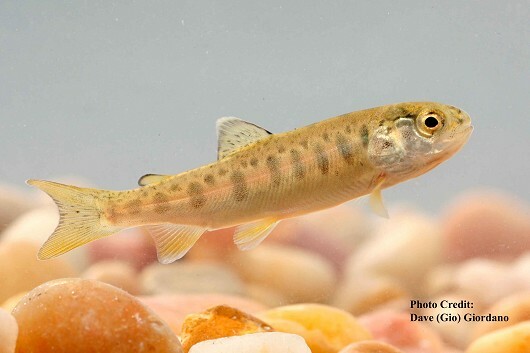 Typically the young Steelhead or parr reside in freshwater for 1-3 years before smoltification (transition to being able live in salt water). When the smolts finally reach the ocean they begin feeding on estuarine invertebrates, krill, and then focus on fish. 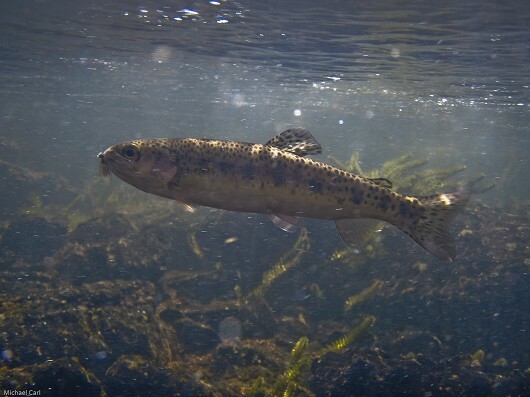 Steelhead may stay in saltwater for 1-2 years before returning to their native streams. Most anadromous salmonids die after spawning but Steelhead may make numerous trips back and forth between fresh and salt water to breed. Steelhead may spawn up to four times per life span, though the mortality rate between successive cycles is high. 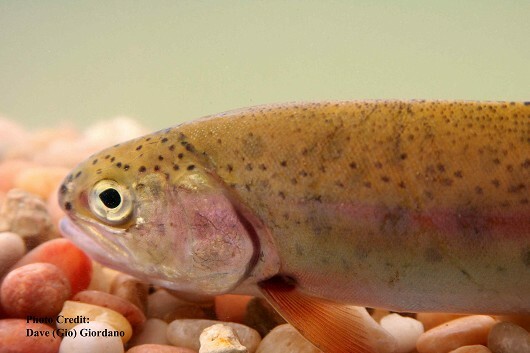 Rainbow Trout do not commonly live beyond 6 years, though fish have been recorded to reach 9-11 years. 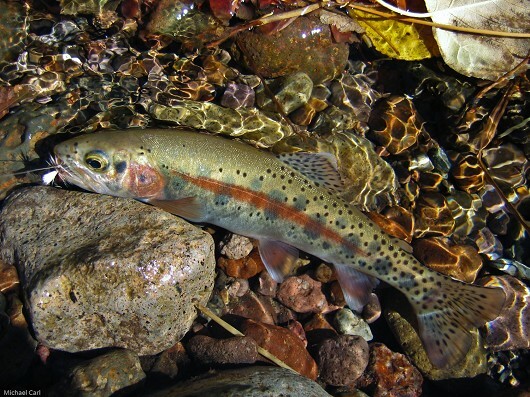 Within a stream resident Rainbows and freshwater phase Steelhead have in-stream habitat preferences generally determined by size. The smallest fish are mostly found in riffles, medium sized fish in runs, and larger fish predominantly in pools. In streams and lakes Rainbow Trout feed on zooplankton, invertebrates, insects, drifting organisms, and sometimes other fish. Feeding usually peaks at dawn and dusk and summer consumption is greater than that in winter.